My sweet lord, what a powerful opening. The first track of Varen’s self titled EP and debut release is a moody sundclip of moans and flies buzzing. This short introduction leads into “Hic Incipit Pestis” ( Here begins the plague) which is particularly fitting seeing as this Belgian duo is more than capable of making music which sounds like the decaying of flesh and the last breathe of masses dying in agony. I could be wrong though, it maybe a little brighter than that. Probably not. Varen is strange because they seem to have come from nowhere, without any past experience, and with a self titled EP that is extremely well crafted. 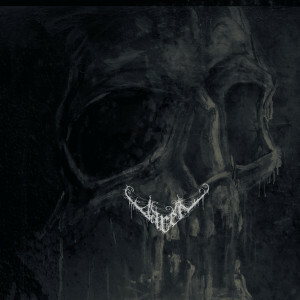 The band’s logo is a sinister and crisp hanging triangle design on a painterly skull figure. The whole album cover is effective and fitting to the angular and atmosphere style of of the music. Songs like “Attero Sententia” begin with moody guitar strumming before breaking into blurry atmosphere. While others like “Odium” rely on a spine of groove throughout its entirety. Even though the guitar dominates most of the mix with its texture, the production from the synthetic drums to the virile vocals are chilling in their presence and also effectiveness. Varen feels like a band that hasn’t hit a creative peak or stride. Though their self titled EP is decent enough, the possibility of further experimentation and exploration of the sound could bring more interesting and wild material.The band already has a sturdy foundation in desolate dimensions. Until then however one is left with a 24 minute EP which blows like a cold gale through stone strictures. It always makes me smile when bands mimic uncomfortable forces of nature.